For 21 years, Dulaang ROC has held its tradition of welcoming non-ROC members to a play competition at the end of a successful academic year. This 2019, the theatre organization will have its annual Play Competition entitled “Padayon: The 22nd Dulaang ROC Playfest” wherein participating teams from inside and outside UA&P must produce the chosen script of the same theme provided for them and compete against each other for the Best Overall Production Award with a cash price of Php 10,000. 16 certificates will also be given for those who will win the special awards such as Best Group Dynamics, People’s Choice Award, Best Director, Best in Script ad Story, Best in Marketing, Best Production Design, Best in Lighting Design, etc. This year, chosen scripts will revolve around the common theme Padayon, a Visayan word that goes deeper than what it may seem, “moving forward” or “onward”. Instead, Padayon will be expressed as a journey towards a destination by showcasing the process on how people work together or even how a person decides to think and act in order to reach their goal/s. Hence, through this play competition, Dulaang ROC continues to be true to its mission in developing people’s skills and appreciation for theater arts and promoting Filipino playwrights and culture. They also aspire to help make people aware of our nation’s padayon as a culturally diverse country; and as it develops into a society that strongly patronizes its own roots and culture. For Dulaang ROC’s 22nd Playfest, they will showcase 5 plays: ‘Bulong,’ ‘Away Bata’, ‘Bangkay Bust,’ ‘Kapit-Bisig,’ and ‘Liwanag ng Mata’. Moving Forward from the Domino Effects of Someone’s Death. The first play entitled ‘Bulong’, written by members of Teatro Paulino (SPCP), Kimverly Jane M. Javier, Alexandra M. Santelices, Jenn Keizha C. Tena and also directed by Kimverly Jane M. Javier, is a play about the Filipino culture of “bulong”. Kitty, Celine, EJ, and Prescila discover their wishes as they whisper on the tombs of people who cared for them, of whom they love and loved, of strangers, and of whom they could have met. But, will they really be able to realize what they desire to happen in their own lives? Onwards to Unity despite Differences. The second play, ‘Away Bata’ written by John Encela and directed by Diosary Timbol, members of Tanghalang Lykeion (LPU – Cavite), is based on the creationism story of Bathala, Ulilang, and Galana. It is about two chieftains of two rival tribes in ancient Cordillera who must unite for one purpose. Little do they know, this pact of unity might bring danger to both tribes. Will the two tribes successfully create a pact which could lead them to their goal? Moving Forward from Regretful Mistakes. The third play is a Filipino folklore entitled ‘Bangkay Bust’ written by Nico Vicente and directed by Paul Lou Guerrero, members of Dulaang ROC (UA&P). The story is about Julius, who is being hunted down by “aswangs” for blessing dead bodies, making them inedible for “aswangs.” After being cornered into an abandoned warehouse, he makes a bet with the “aswangs” chasing him. Tensions start to arise with each challenge being thrown but only one thing seems to be clear. In the end, what exactly will be Julius’ end? This play may seem simple but there is more to this than just a game of cat and mouse. Continue to Fight for the Filipinos’ Rights. The fourth play entitled ‘Kapit-Bisig’, written by Juan Cabrera and directed by Timothy Guevara, also members of Dulaang ROC (UA&P), is inspired by the story from the strike of the Sumifru Banana Corporation workers. In the play, plantation farmers and factory workers of the Del Sanay Banana Corporations plans to go on strike after facing harsh working conditions, unlivable wages, lack of benefits, and harassment from paramilitary forces. Led by union leaders Minda and Eric with solidarity from church people and militant youth activists, they lay out their plans, discuss their problems, and highlight the importance of going on a strike in the first place. Will they succeed or will their efforts be put to waste? Moving Forward from “I” to “They”. Lastly, the fifth play, was written by Jesca Canto & Red Hernandez and directed by Jesca Canto (UA&P) entitled 'Liwanag ng Mata'. In this story, Bathala’s death causes conflict to occur within his sons and daughters after leaving without any will. Apolaki, the prideful eldest son, and Mayari, the eldest daughter, justifies their position to replace their father as the next powerful deity of the Sky. Who will win and replace their father’s position? 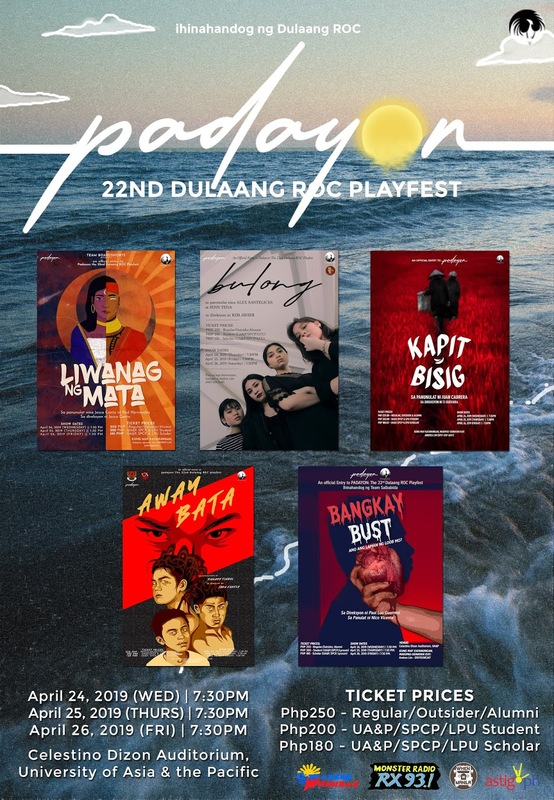 Find out the full stories of ‘Bulong,’ ‘Away Bata’, ‘Bangkay Bust,’ ‘Kapit-Bisig,’ and ‘Liwanag ng Mata’ by watching Padayon, Dulaang ROC’s 22nd Playfest which will be held on April 24-26, 2019 at UA&P’s Dizon Auditorium. Next year, Dulaang ROC will continue to open their doors for non-ROC members to join Dulaang ROC’s 23rd Playfest. Through this production, the theatre organization aspire for more people who have passion for theatre to come and join the next coming annual play competitions and generally in producing stage plays.